So, where was I? Oh yes…I was drifting off to sleep after returning from a wonderful Indianapolis Marathon trip and PR. Normally, I would be looking forward to sleeping in on Sunday morning, eagerly anticipating our pancake Sunday ritual and a lazy morning. However, this weekend, thanks to some friendly encouragement (ok, it didn’t take much), I decided to run my first official “double”. It was only fitting that I returned to scene of my very first marathon 4 years earlier. When I lined up at the Des Moines Marathon in 2009, I truly had no idea how far I would come in such a short period of time. Many things have changed in my life over the last 4 years, mostly for the better, and throughout it all, running has been a consistent companion. I woke up around 5:30AM, and slipped on my running clothes, including my newly christened Marathon Maniacs singlet, and ate a small breakfast. It was a tad chilly, but 38 degrees feels a lot better when there is no rain coming down, so I didn’t mind one bit. I hopped in the car and pick up a friend who was running the half and graciously agreed to stick around until I was done, as well as cheer on many of our other mutual friends running that morning. We arrived in Des Moines with plenty of time to spare, and were able to park a few blocks from the start in a private lot, which was certainly convenient. We both wandered down to the start area on a bridge over the Des Moines river and soaked in the race atmosphere. Photo Credit: DM Juice- Waiting on the Locust St. bridge. We probably only waited around for 15 or 20 minutes, so I didn’t mind being a bit chilly. Despite having run a marathon the previous day, my legs felt surprisingly strong and painless. I was a bit stiff, but no more so than I would normally feel prior to a long run. I guess the high mileage training over the past few months was starting to pay off! The gun went off promptly at 8:00AM, and we slowly worked our way to the starting pad and began running. The full and half-marathons began together for the first 2.5 miles, so my friend and I were able to run together. I had lined up near the 3:45 pace group, thinking that I would attempt to hang with them as long as I could, and hopefully come in under 4 hours. As the routes split, I waved goodbye to my friend and promptly jumped into the Porta-potty quickly. Aside from finishing, I truly had no initial expectations for this race. I was unsure how my legs would respond after the previous day, and I wanted to have fun returning to the scene of the crime! Photo Credit: DM Juice- The race total topped 10,000 this year for the first time! I caught up to the 3:45 pacer, and passed him after a mile or so. From that point on, I was on my own. I ran into several other Maniacs along the route and again soaked up the reciprocal energy that came with our common bond. I was hitting 8:20 miles through the first 10 miles and still feeling good so I just decided to continue running how I felt and see what happened. As usual, the crowd support along the route was fantastic, and the water stops were well-organized and announced well in advance. The race organizers have been putting this race on long enough to really know what they were doing and it showed. At the half mark, i was still pulling down 8:20 miles, and my legs were feeling pretty good. I had forgotten how subtly hilly the course was, however, and they began to sneak up on me more and more. I fought the urge to look back and see if I could spot the 3:45 pacer, but I knew from my splits that I had banked a few minutes. I could have easily slowed down if I had wanted, but my legs were feeling good, and my endorphins were pumping! Around mile 18, just as I was entering Waterworks Park, my legs reminded me that I had run a 3:30 marathon the day before. The park has a reputation for being a difficult stretch because it is fairly open and usually has less crowd support. However, I have always enjoyed the opportunity to silently reflect on my running at that point, and I took advantage of the next three miles to process how the weekend was unfolding. I pulled back to an 8:45/mile pace, but kept pushing forward and even received a wonderful pick-me-up from a couple of friends who rode into the park to cheer folks on! Photo Credit: DM Juice- Definitely a beautiful course. i entered a loop around Gray’s Lake and could hear the 3:45 pace group not far behind me. At that point, I was committed to holding them off as long as I could but had already arrived at a place of happiness and contentment in a weekend of hard work. I remained consistent through those final miles, and my legs continued to hold up, although I was certainly ready to be done running for the weekend. As I entered the finish area, my friend was waiting to cheer me on and I pushed it hard through the finish line. I crossed the line in 3:42:53 and I was ecstatic! 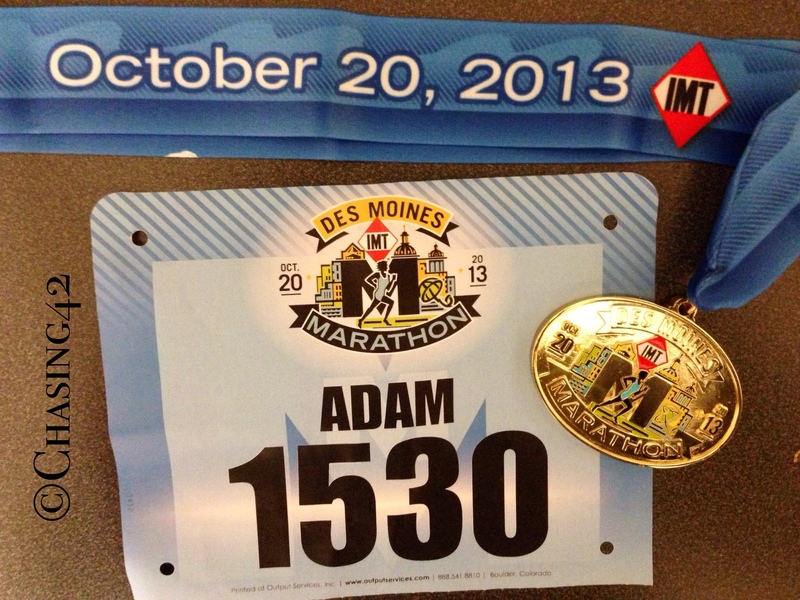 If it hadn’t been for the previous days’ race, I would have earned a PR in Des Moines as well. I picked up my medal, ripped off my timing chip, and collected my water and snacks in a process that has now become almost ritualistic. We claimed our free beer and relaxed for a bit, and then headed back to the car for the drive home. As I look back at my first marathon and draw comparisons, many things haven’t changed. However, my confidence in my ability, regardless of time, is in some ways the biggest accomplishment of all for me. In a simple, unassuming manner, I proved something to myself this weekend. Training will always be there, but these experiences will continue to be special no matter how many times I cross the finish line. I’ll always find something unique to remember, someone to connect with, and some way to grow as a runner. This weekend taught me to truly “embrace the race”. You truly are a machine…and an INSPIRATION!! 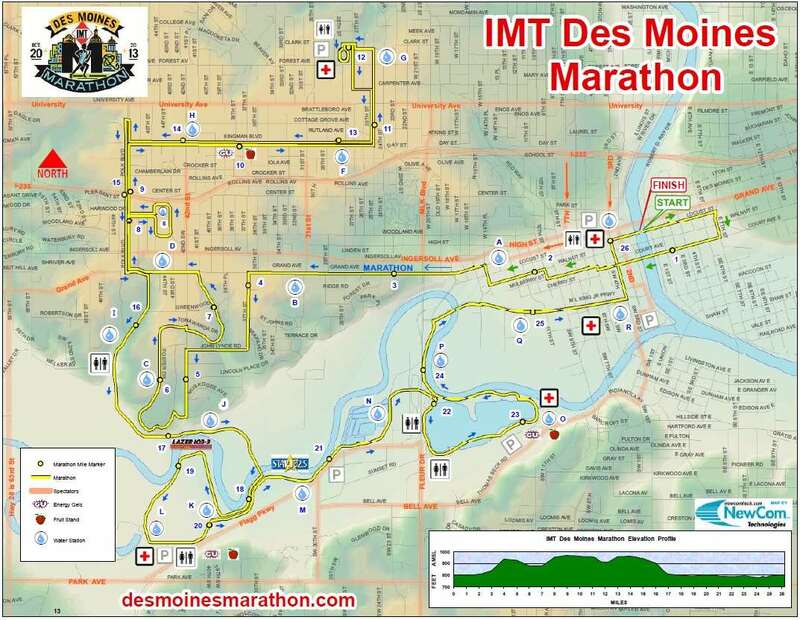 As a Des Moines native myself, I love the Des Moines Marathon! Looks like you had a great time — and a great race! Congrats on a job well done! Thanks, and thanks for stopping by to take a look!